The Sugar Kings don’t play by the rules. They make their own. “We’re a band in the spirit of the jug band — but we don’t have a jug,” explained member Cam Waters, a former Red Wing musician. The trio has brought together the distinctive sounds of the sousaphone, the resophonic guitar and the harmonica to create an improbable but highly pleasing sound which is finding a growing audience. Of course, they started out pretty big. The Sugar Kings’ very first gig four years ago was at a St. Paul Saints game. “We played to 6,000 people — two at a time,” Waters said. They were set up by the gate to entertain people entering the stadium. The Sugar Kings — Waters, Clint Hoover and Steve Sandberg — may be found at all sorts of venues nowadays, from community festivals to art fairs and theater stages. Last weekend they were at Rhythm & Brew coffeehouse in Lake City. Next week they’re booked at the Minnesota State Fair. The band will play for a Nov. 10 Folk Forum concert at Oak Center General Store in rural Lake City. Their jug band music has broad appeal. “It’s a very hard genre to define,” noted Hoover. “It incorporates a lot of stuff — minstrel, cowboy, blues, jazz, Tin Pan Alley” and other standards that come under the umbrella of Americana. The three individuals came to the Sugar Kings along different paths. Waters, who lives in St. Paul now, started playing guitar at 18 and performing in public at 20. Quite well known in Red Wing, the singer-songwriter has done concerts, coffeehouses and school residencies over the past 12 years or so, and teams with Sheldon Theatre Director Sean Dowse every summer to put on an arts camp at YMCA Camp Pepin. Trombone is Sandberg’s first instrument, but he began playing tuba when he was with the Wolverines Big Band in the 1970s. A lot of Big Bands in the 1920s used tubas for bass, he explained. “I really got to like it,” he said. Sandberg, from Minneapolis, was the tuba player on a Dakota Dave Hull CD several years ago — which brought him to Waters’ attention. Waters needed a tuba for a CD he was recording, Shoe Town, released in 1996. Both of them had heard Hoover play so they gave him a call. Hoover, also from Minneapolis, had been playing blues harmonica since he was a teen-ager in the early 1970s. “I just liked the sound,” he said. All three liked the idea of a blues group with guitar, tuba and harmonica. The name was Waters’ idea. About 10 years ago, he saw “Sugar Kings” on a jersey for a baseball team from Havana, Cuba. “I thought it was a great name for a blues band.” The others agreed. The band began building a repertoire, resurrecting songs that had fallen into obscurity. When he’s a Sugar King, Waters uses two funky National Resophonic metal guitars that were popular with jazz and blues groups in the ‘30s, plus he plays the “Hi-Hat” cymbal, kazoo and whistle. Sandberg switched to a sousaphone, the marching band version of the tuba for which the bell is up high instead of in front of the player’s face. Hoover shows up for gigs carrying two cases filled with nearly three dozen harmonicas — one diatonic instrument for each key plus backups, and several of the larger chromatic mouth organs that can alternately play the equivalent of either the black keys or the white keys of a piano. The band’s performance Saturday night in the intimate setting of Rhythm & Brew coffeehouse in Lake City was a good demonstration of its broad appeal. The Sugar Kings have released one CD, Take Your Time, Mr. Brown, which can be heard frequently on Minnesota Public Radio’s morning show. Each of the musicians also is featured with other groups and on other CDs. 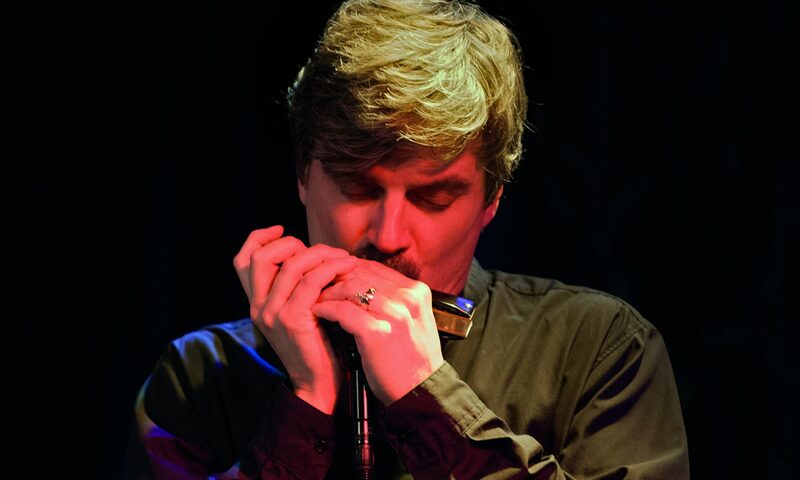 Hoover performs and records with Brian Barnes as Jazz Deluxe; a full-time musician, he also teaches harmonica in the Twin Cities. Sandberg also plays with Prairie Heym Klezmorim, a group that performs lively Jewish dance music from Eastern Europe. Waters also is a soloist who performs much of his original guitar and vocal music in different settings. He is studying to become an elementary teacher and will do his student teaching through the University of Wisconsin-River Falls this fall with third-graders at an inner city magnet school in St. Paul. The Sugar Kings will perform Aug. 29-30 at the Minnesota State Fair. The trio is booked to perform two 45-minute sets each day at the Ramberg Senior Center, located on Underwood Street across from the agriculture-horticulture building. They’ll play at 10:30 a.m. and 11:30 a.m.
It’s not the band’s State Fair debut. Last year the Sugar Kings — Cam Waters, Clint Hoover and Steve Sandberg — appeared as a house band when Minnesota Public Radio broadcast its morning show live from the fairgrounds one day, plus two of the members have memories of performing at the fair years ago. Hoover’s story dates back to 1974, when he was in the Talent Show. He and his harmonica made it into the top 10 two years in a row. “That kind of got me going” as a performer, Hoover said. Sandberg also previously entertained — and in the same location where the Sugar Kings will play next week. He was with a Dixieland band then, and also appeared for years with the Wolverines Big Band.